We welcome your visit to the Arab world and your administration’s initiative to bridge differences with the Arab-Muslim world. To view entire letter, click here. 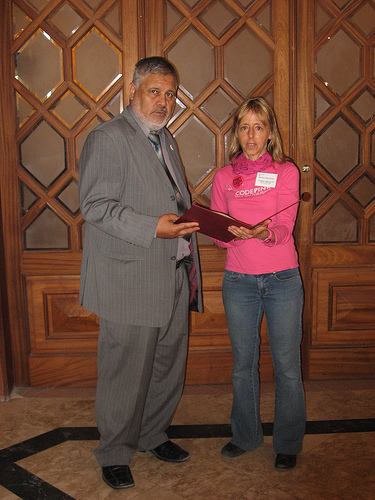 Medea Benjamin, CODEPINK co-founder, with Deputy Foreign Minister Ahmed Yusef, the Hamas official who signed the letter to President Obama. Benjamin and a delegation of 66 delivered the letter to the U.S. Embassy in Cairo June 4. At 9 a.m. June 4, the delegation of journalists, social workers, professors and activists will carry the letter to the U.S. Embassy here along with a petition signed by more than 10,000 Americans asking Obama to go to Gaza to witness the impact of the recent Israeli invasion there and its ongoing blockade of the Gaza border. Mr Barenboim founded the joint Arab-Israeli orchestra, the West-Eastern Divan Orchestra, with the late Palestinian-American writer Edward Said in 1999 to further cultural exchange between young people in Israel and the Arab world. 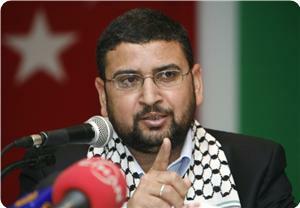 His views earned him an honorary Palestinian Authority passport in 2007. Laila Al-Hadid, author of the blog “Raising Yousif and Noor,” has been denied entry into Gaza, where she’s originally from. After waiting 36 hours in Cairo’s airport, they deported her and her two children back to the US. She communicated with the world through twitter and the web. 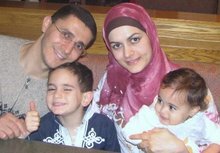 Click here to see her blog “Raising Yousif and Noor”. “I’m recording my ordeal with my flip mini,” Palestinian journalist Laila Al-Hadid told friends and relatives who subscribe to her Twitter service shortly after she was detained at the Cairo airport en route to her native Gaza. News of her detention and questioning was made instantly available to the international news media via three technological innovations spurring instant communication: wireless internet at the airport, Twitter, and GroundReport.com. We have been stuck in Cairo airport for nearly a day now. We are neither being allowed entry or exit by Egyptian authorities, who insist that as long as Rafah Crossing is closed, they are under strict orders not to allow Palestinians in. This is despite a signed letter of consent I received personally from the Egyptian consul-general in Washington the day of my travel from the US. To quote the Egyptian officials here in the airport “so sue him”. I tried to plead that it was not my fault Egypt was in the way of my home- that if I could,I’d parachute in; that i simply wanted to go back home. Fatah and Egyptian spokespeople maintained that talks had been scheduled for 26 April, though Hamas remained silent on the issue until 9 March when they confirmed the set date. In a statement to the Quds Press, Sami Abu Zuhri, spokesperson of Hamas, called on Fateh movement “to free itself from the US preconditions”. “We are not the problem”, Abu Zuhri said, “The problem is in those who link the success of the talks with an American blessing”. He also said that Ramallah government is illegitimate, and that any new government will not be legitimate unless it is presented and approved by the legislative council.